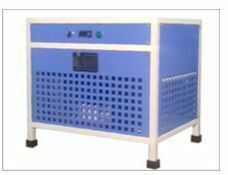 We manufacture refrigerated Air dryer by using the latest technique. We use combi heat exchanger which works at full efficiency for drying the air. This dry air can be used for pneumatic tools, equipments & processes. Capacities : 10 cfm to 150 cfm. Operating voltage : 1Ph / 3Ph. 50 Hz.